challenging but very interesting and fun track. after turn 1 i realized brake fluid spilling all over the tank, windscreen, dash... wrapped it. the tires showed a very strange pattern... there is a clear cut between the two compounds. i was running 29 psi front, 27 rear. what can i say about the bike on the track? 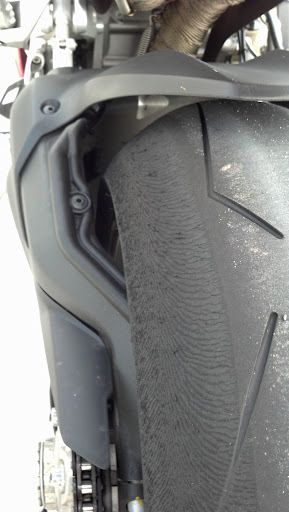 1. to be honest: for a not so skilled rider, more bottom end torque would be helpful sometimes. 4. the overall feedback of the bike is just awesome. i could exactly feel when the rear came out a little bit. 5. braking stability is the burner. had the abs in mode 1 and 2, in 1 it was a little more samba and rumba. the confidence of just being able to hit the lever is worth more than 2 tenths (for occasional trackers like me). 6. just roll around? forget it. after 3 turns i was done. it was a whole lot of fun and i will return for sure! Looks like a nice track! A lot of people are criticizing it saying it's not safe for bikes. 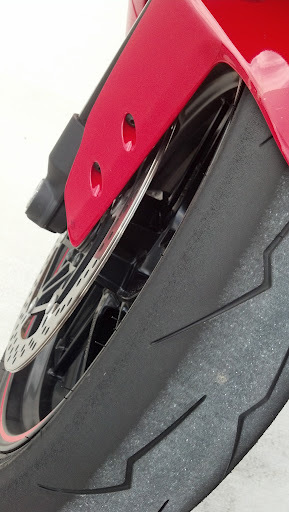 And I know Sport Bike track time dropped it's plans to do days there. I'ts good to hear from someone who's ridden it. 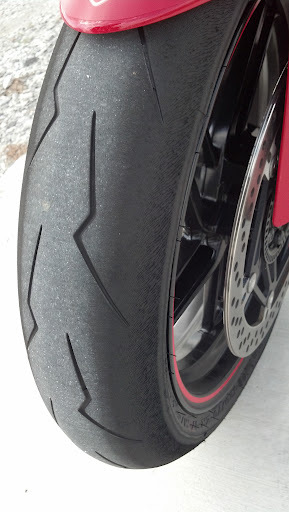 well, if i was a company like stg or had to do any instruction work with riders, it might not be the preferred track. the potential for hotheads or novices to run off due to a missed line or braking point or running into the tires is higher than on other tracks. it is a challenging track for sure. but also a lot of fun! A track to yourself eh? Nice stuff and thx for sharing. Great to see ya out there man, I know you were talking alot about it. Yes. Shaved the hair off and sticked a gopro plate on. Can't take it off now. LMAO!!! I knew it ! 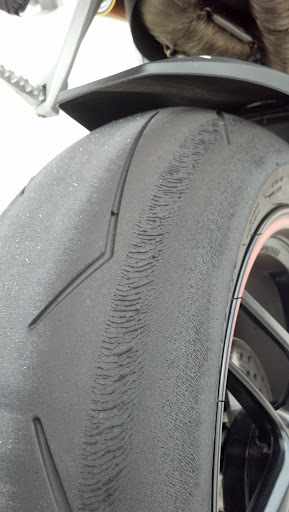 Hey Im going to send pics of your tires to my Pirelli pro to see what he has to say about that wear pattern. Let ya know. Still nothing in the mail from that young lady ? Looks like a hot tear on that rear. Send 'em! We had temps around 88. "Guess" the track was around 120. I agree.. do you know what tire pressure you where running?